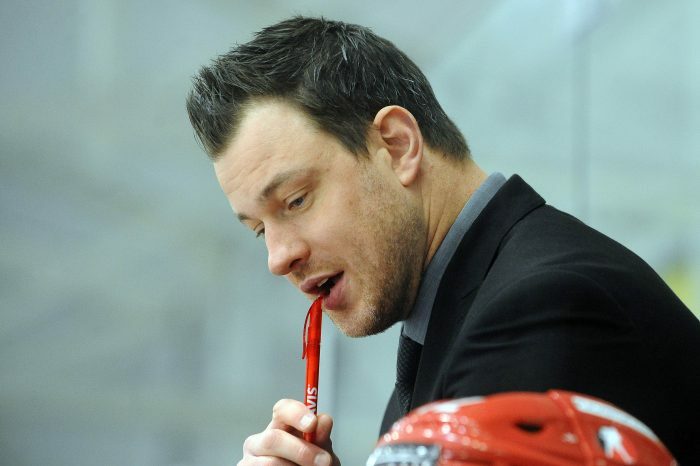 Cardiff Devils coach Andrew Lord. Pic: David Williams. Andrew Lord’s Cardiff Devils are mentally and physically prepared for their Elite League Predictorbet play-offs semi-final against Nottingham Panthers today (Saturday). Devils take on Panthers in the second fixture at the Motorpoint Arena in Nottingham and head coach Lord says: “This weekend is great for the league. “The final four teams and the venue will be packed. It takes me back to college days. There will be loads of energy in the building – and four really good teams out on the ice. “We’ve won a lot of big games on road against good teams and we have team confidence. If we stick to our game plan we’ll be in good shape. Belfast Giants v Guildford Flames is the first semi-final, while Devils v Panthers starts at 5pm.Both games are being streamed live. Devils defenceman Gleason Fournier was among the winners in the 2018-19 Elite League awards, which were dominated by champions Giants. All games at this weekend’s PredictorBet Playoff Finals will have video review available in the form of a special ‘War Room’ facility. The process, successfully trialled at the Challenge Cup Final, means all review decisions will be taken by a ‘Video Referee’ sat elsewhere in the arena. “Up in our own version of the NHL’s ‘Situation Room’, we will have a referee checking video footage for goal reviews,” said hockey operations manager Mike Hicks. “In line with IIHF events, immediately after a goal is scored the video official will check that everything is within the rules of the game while the team celebrates a goal. The on-ice referees may still ask for reviews themselves and each team has one ‘Coach’s Challenge’ as was the case during the regular season. On-ice officials will be mic’d up, allowing them to communicate better on the ice – and, if all goes well, to call penalties over the public address system.